Over 60 million Americans are suffering from some degree of periodontal (or commonly known as gum) disease caused by a sticky plaque build-up on the teeth. Most of our patients find that, daily brushing and flossing is enough to fight dental plaque build-up. However, in some cases, the plaque build up is so severe that it has to be removed via pocket reduction surgery. If you are suffering from gum disease, visiting Arizona Periodontal Group for an assessment can be vital. If needed Dr. Trujillo can provide pocket reduction surgery in Phoenix, Arizona. Dr. Trujillo and his highly trained dental team at Arizona Periodontal Group have been working together for years to provide patients of Phoenix with top-quality dental care. With state-of-the-art technology and years of dental training, you can feel confident that you are receiving some of the best dental care in Phoenix. Dr. Trujillo is highly educated in procedures like dental implants, bruxism treatments, LANAP, and pocket reduction for severe cases of periodontal disease. You can schedule an appointment for a consultation with Dr. Trujillo for the best treatment option for you. You also can to learn about more information on our other dental service we offer. We can’t wait to help you improve your smile and quality of life. A periodontal pocket is formed when dental plaque builds up around and between the teeth. 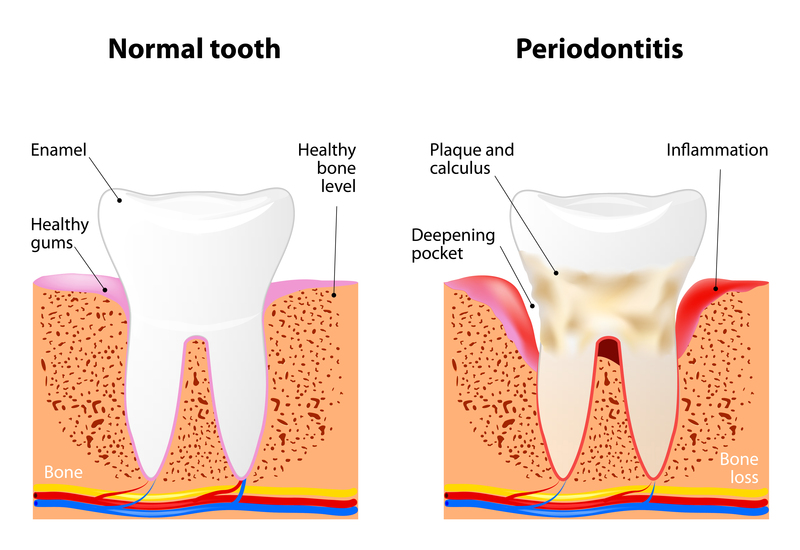 If left untreated, periodontal pockets begin to attack the teeth and gum tissues, resulting in receding gums ,missing teeth, and in more advanced cases, bone loss in the face and mouth. Everyone has a dental pocket and typically,dental patients have a dental pocket of about 2-3 millimeters deep. When a periodontal pocket grows to a depth of 5 millimeters, it’s time to seek our help. Pockets this large can not be removed with at home brushing and flossing. If you have deep periodontal pockets, it’s important that you receive treatment as soon as possible to prevent further damage to the teeth and bones. A periodontal pocket is formed when dental plaque builds up around and between the teeth. If left untreated, the bacteria begin to attack your teeth and gum tissue. Pocket reduction surgery stops bacteria and plaque from spreading to surrounding tooth and gum surgery. Bone loss is a common symptom of missing teeth and gum disease. Stop bone loss (and gum disease) from furthering with pocket reduction surgery. Because the plaque build-up is removed, patients find it easier to maintain their oral health following treatment. Regular brushing and flossing is easier than before, and it isn’t a chore to keep them maintained! When affected with periodontal disease, the teeth and gums can look brown and rotted. The appearance of the smile is improved with pocket reduction surgery because the gums are restored and the teeth are cleaned. What Is Pocket Reduction Surgery Like? After Dr. Trujillo measures your periodontal pockets to determine which treatment option is best, he will apply local anesthesia to the areas affected. We are committed to making your surgery as comfortable and painless as possible so local anesthesia is used during surgery to keep you as comfortable as possible. Next, he will move back the gum tissue and clean away the gum disease causing bacteria. Once clean, Dr. Trujillo will move the gum tissue back into place and reattach it to the teeth with small stitches. Most of our patients report a slight discomfort and gum tenderness in the days following pocket reduction surgery. Over-the-counter pain medication is often all that is needed for pain post-operation. Patients should expect the stitches placed in surgery to dissolve after 10-14 days. Most patients can return to their normal habits in about a day or less, but the healing time depends on how your body reacts to surgery. To ensure that you heal as fast as possible, we will recommend that you follow a post-operation procedure of a saline rinse. Patients should take any antibiotic medications exactly as they are prescribed, for the duration it is recommended. Patients should follow a daily brushing and flossing routine to keep the teeth clean, healthy, and functional. It is recommended that patients visit the Arizona Periodontal Group twice yearly for a regular dental exam and screening to ensure that any further sign of periodontal disease is treated. If you are suffering from any level of periodontal disease, don’t let it affect your life anymore! Stop gum disease in its tracks with a consultation appointment at the Arizona Periodontal Group in Phoenix. We pride ourselves in providing our patients with a personalized level of care that they deserve. Call our offices at (602) 459- 9459 to schedule your consultation appointment for pocket reduction surgery in Phoenix today!